Last Wednesday, the Jane Austen Centre in Bath, England unveiled the wax sculpture above, which they say is the closest “anyone has come to the real Jane Austen in 200 years.” The figure, The Guardian reports, is the creation of forensic artist Melissa Dring, a “specialist team using forensic techniques which draw on contemporary eye-witness accounts,” and Emmy-winning costume designer Andrea Galer. Austen often introduced her characters with broad descriptions—Emma Woodhouse is “handsome, clever, and rich,” Pride and Prejudice's Mr. Bingley simply “a single man in possession of a good fortune.” But her talent consisted in undermining such stock descriptions, and the societal assumptions they entail. Instead of types, she gave readers complicated individuals squirming uncomfortably inside the bonds of propriety and decorum. But what of Austen herself? Readers initially knew nothing of the author, as her novels were first published anonymously. 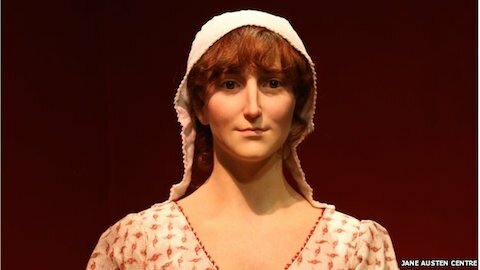 Based partly on that description and others from niece Caroline, the wax figure, Dring told the BBC, is “pretty much like her.” Austen “came from a large… family and they all seemed to share the long nose, the bright sparkly eyes and curly brown hair. And these characteristics come through the generations.” Dring used Austen’s sister Cassandra’s famous portrait as a starting point, but noted that the sketch “does make it look like she’s been sucking lemons […] We know from all accounts of her, she was very lively, very great fun to be with and a mischievous and witty person.” All descriptions with which her devoted readers would doubtless agree. See more photos of the Austen wax sculpture here.